I just realized I never showed you my birthday gift. Well, it has only been two months! and when I saw this Italian platter it had my name all over it. The platter is hand painted and most likely from the mid to late 1800s. will be hung next trip home. wood was a little yellow for my taste. Gorgeous! 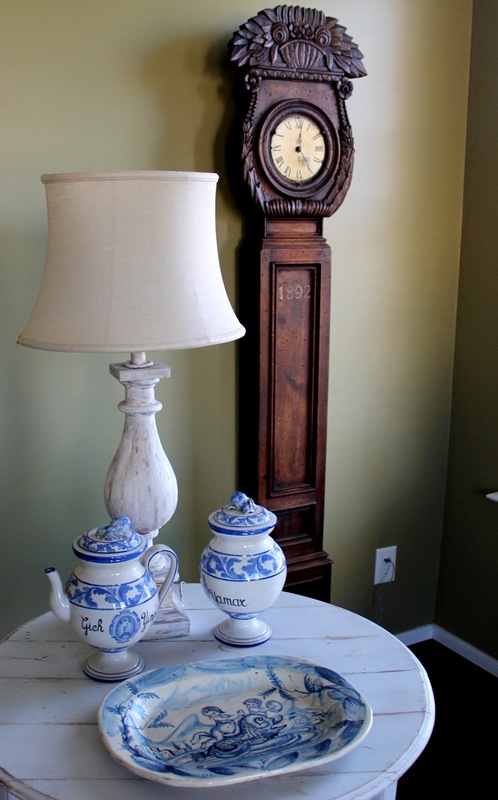 Love your vignette and your clock is beautiful…the perfect backdrop for your beautiful blue & white! Would love for you to share tomorrow at AMAZE ME MONDAY! Happy belated birthday Sherry! What a beautiful platter! Love that corbel! What a great find! Sherry, that platter is amazing. I was going to buy one of those corbels at High Point market, but they were all sold. 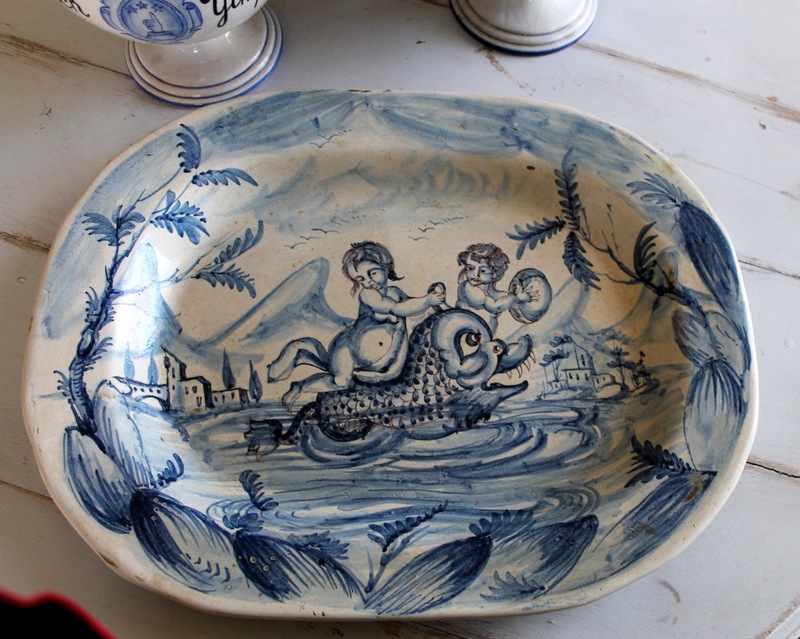 Love the platter…it reminds me of the Brownfield elf plates of the same era. Beautiful birthday present sweet friend..my very fave kind!! Love the vignette. Enjoy the rest of the weekend. I love the blue platter. Lot's of fun character. I too love your clock in the background. Really beautiful. I am lusting after the platter!!! Lucky you to have such a beautiful find!!! Love the jars and the clock too!!! Blue and white is a wonderful color combination, IMHO. Your platter is so pretty and unusual. 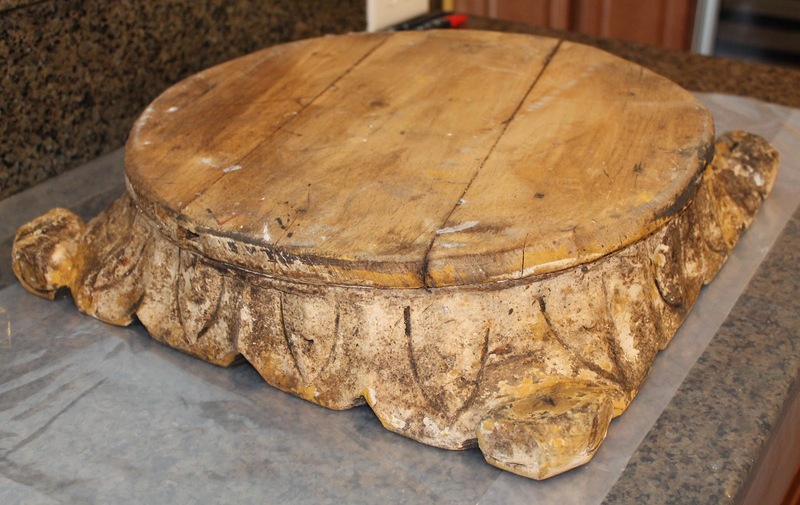 Looking forward to seeing your paint transformation on the column base. I cannot wait to see what you do with the corbel. Great gifts, Sherry. what great birthday treasures! Love the blue and white! can't wait to see what you do with the wooden pice too! Love the Italian platter, so happy you found it for your birthday! The platter is really one of kind, being hadn painted. And I love your clock we can see in the background. Birthday gifts that just keep on giving!!! Lovely. What wonderful gifts, Sherry! Can't wait to see what you do with the corbel. Your birthday gifts are beautiful. I love blue/white dishes as well, and that corbel is impressive- I can't wait to see what you do with it. The hand painted platter is just gorgeous! You had fun on your birthday. I live near Mt. Dora but don't go very often. Now I'm wanting to go again! Love the planter and the corbel. Great finds. I hope you had a wonderful birthday!! Sherry, I'm struggling with some of the same upload issues and even the loading of certain blogs. I appreciate your dedication to the party and us. Thanks so much for your time! Such pretty things. Happy belated birthday. Sherry I love all your treasures! I have been trying to find some of those corbels for awhile now. They come in three different sizes. I wish I knew who made them. Your blue platter is just beautiful! Sounds like you had a great birthday. Thanx for partying at my place!